We thought we’d done all our celebrating after reaching 100 employees but the accolades keep on coming as this week we were crowned ‘Small to Medium Sized Business of the Year’ at the Lloyds Bank National Business Awards! Nicknamed the ‘Oscars of great British business’ by Former Prime Minister David Cameron, the awards took place on Tuesday 13th November at Grosvenor House Hotel on Park Lane, London and were presented by BBC Breakfast’s Naga Munchetty with a keynote speech from the ‘Absolutely Fabulous’ national treasure Joanna Lumley! 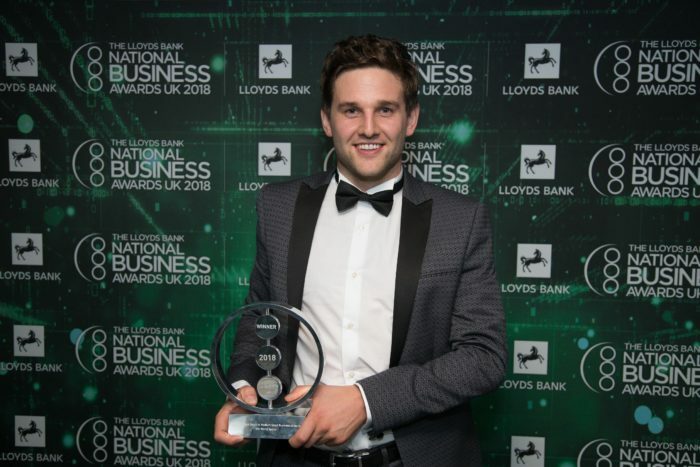 Lloyds Bank National Business Awards 2018. Grosvenor House – London. 13.11.18. ©Steve Pope. Fotowales. 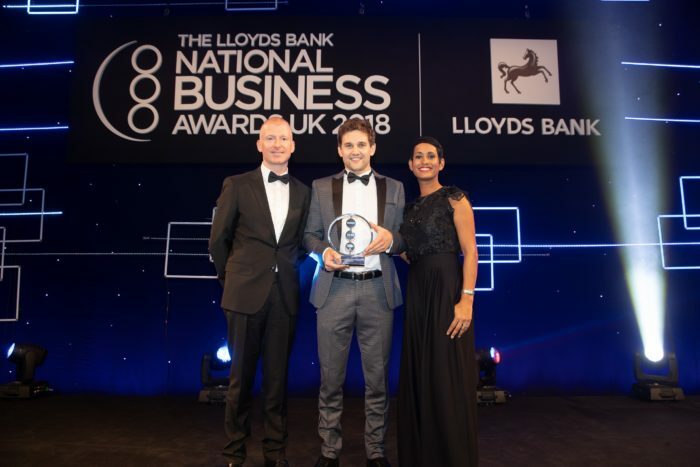 Celebrating the Best of British Ambition, over 1,200 business leaders, entrepreneurs, politicians and journalists attended the 17th National Business Awards ceremony to see who would be crowned the cream of the crop. Celebrating the contribution of SMEs to the UK economy, the ‘Lloyds Bank Small to Medium Sized Business of the Year Award’ recognises the company that has maintained consistent growth and financial performance, has an engaged workforce with effective leadership, can demonstrate effective use of technology / digital media to engage with all stakeholders and is continually innovating to support future growth. 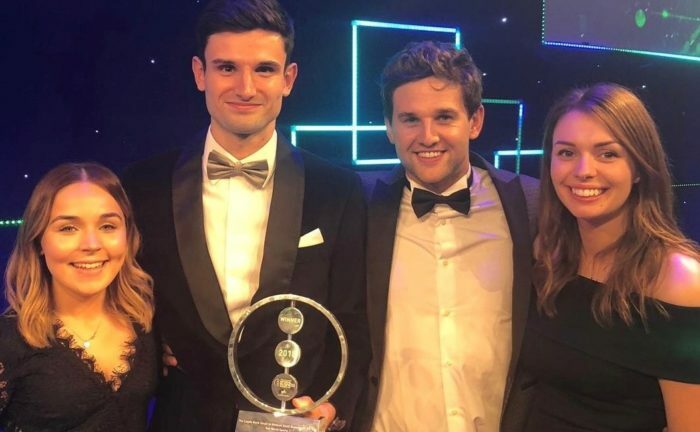 Our MD, Alex travelled down to the awards with Charlotte, Sara and Tom who presented to a room of five well respected and prestigious business leaders earlier on in the year to seal the win. Carrying a 6 x 4 FORZA Football Goal Post on the London Underground to showcase during the 30-minute presentation was a huge feat in itself, so to find out it had all been worth it as we were crowned champions was definitely the icing on top of the cake. We were all over the moon when our Net World Sports was called out as the ‘Small to Medium Sized Business of the Year’ winners. Having been shortlisted for the award in 2016 when we were a smaller operation, it was incredible to come back two years later and bring home the trophy after a phenomenal 18 months of success and hard work by our entire team. The celebrations haven’t stopped there though, as we were revealed as finalists at the Retail Week Awards 2019 the same evening. Shortlisted for ‘International Growth Retailer’ for a second consecutive year, we’re hoping to continue our winning streak! If you fancy joining our award-winning team and becoming part of Net World Sports’ success, take a look at our vacancies here.